When I do feel the need to eat a little bit of grains this will be a go to for me, especially since I have such a love for cereals. I changed a couple of ingredients because I didn't have them in my kitchen today so that gives everyone more options, just try not to skip the orange zest...that was the secret ingredient for sure! blueberries or cranberries or good. 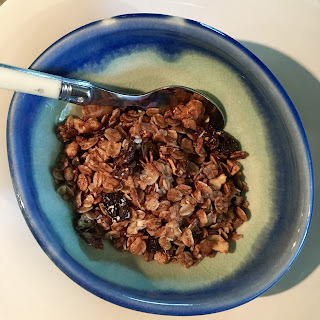 Mix together everything in a large bowl except dates, currents and blueberries. Then turn and bake another 10. Don't burn!